This usually gets one of two responses. People either glaze over and look for something else to talk about, or they are more puzzled and want to hear more. I can’t do much for the former; we can talk about the weather, the latest news, but mostly they prefer to talk about themselves. “What’s going on in your life?” I ask, and we veer away from topics of religion, Yellowstone, and the American national character. For those intrigued by the image of Yellowstone as a place of religion, I jump into the heart of the story. Religion has been a key factor in making Yellowstone an appealing destination, but like the magician’s sleight of hand, we don’t see how it works, we don’t realize its ubiquitous presence. 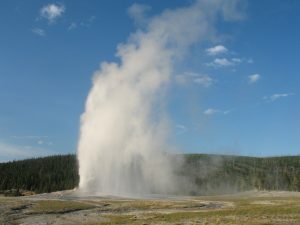 Religious influence remains hidden, out of view, an implicit force driving the engine of Yellowstone’s popular attraction. Religion defines Yellowstone in more ways than most people imagine. My book tells the story of how religion reappears over and over again in Yellowstone.